Frank Dobisky, a member of the 2016 MAST Steering Committee, helped table at the 2016 Bike to Work Day event at Railroad Square in Keene. Throughout the year, MAST makes an effort to table at events around the region that have a nexus with sustainable transportation. 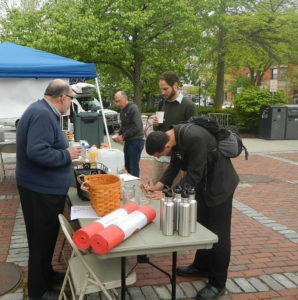 In addition, MAST will occasionally organize or sponsor an event, such as a “Bike to Work Day” celebration in May. The coalition is always seeking volunteers who are willing to help table, organize events, and share information about sustainable transportation options. Please contact us to learn about volunteer opportunities. The MAST Steering Committee is charged with overseeing and coordinating the advancement of the MAST Mission and Vision. The Steering Committee meets on a quarterly basis, and is comprised of between 7 and 11 members. Steering Committee members are elected during the MAST annual meeting. To learn more about the current Steering Committee, please visit our “Meet the Steering Committee” page. If you are interested in working on a specific, actionable project, a great way to get involved is to join a MAST subcommittee. MAST subcommittees are charged with coordinating and executing specific projects identified by the Steering Committee. Subcommittee members must be approved by the Steering Committee; however they do not necessarily have to be members of MAST. To learn more about current subcommittees, please visit our “Subcommittees” page. Any organization (non-profit organization, club, coalition, church group, etc.) interested in creating or promoting a balanced transportation system. MAST’s mission and vision statements shall guide interpretation of a balanced transportation system. Organizations will be asked to assign an appropriate representative. This representative should have the ability to affect policy at, or speak on behalf of, the organization they represent. Individual partners representing themselves are also encouraged to join MAST. Individuals should have an interest in creating or promoting a balanced transportation system. MAST’s mission and vision statements shall guide interpretation of a balanced transportation system. To learn more about becoming a MAST Coalition partner, please see the MAST Charter or contact us. Reaching out to potential MAST partner organizations to help build the coalition and increase diversity of its membership. Please do not hesitate to contact us if you or your organization would like to support MAST in any way.